Jen’s friend Christine alerted us to a fascinating and highly-addictive website called brand tags. The concept is simple: the site shows you a familiar brand logo and you type the single word or short phrase that comes to mind when you see the logo. The site is a social tagging experiment, and it aggregates all of the phrases for each brand into a tag cloud. (For those unfamiliar with a tag cloud, it’s a way of visually showing the prevalence of a certain tag. The more often a brand phrase is tagged by users, the larger it appears in the cloud.) The site is a side-project of a marketer, and in his blog he reports that he received over 600,000 tags in the first 2 weeks. What first comes to mind when the masses think of NPR? High recognition and a lot of favorable brand attributes, such as “intelligent”, “smart”, “honest”, “good”. We also have some negatives: “boring”, “stodgy”, “old”, “who?”. There are some misperceptions to overcome, such as “liberal”. And let’s not forget “schwetty balls”, the legacy of a very memorable Alec Baldwin SNL skit. What about Taco Bell’s brand tag cloud? The largest brand associations with Taco Bell, after CHEAP FAST MEXICAN FOOD appear to be CHIHUAHUA and DIARRHEA – yikes! Comments? What did the masses say about some of your favorite brands? This entry was posted in Marketing, Social Media, Web, Word of Mouth on May 22, 2008 by Javaun. Amid all the outcry over Beacon’s privacy concerns, (like having Facebook tell your wife what she’s getting for Christmas) the simple brilliance of Facebook’s on-site advertising is going unnoticed. Here’s a personal account of how Facebook’s relatively straightforward “sponsored messages” are finally making personalized word-of-mouth a reality. Word-of-mouth on product review sites and bulletin boards is nothing new. Likewise, I could always get a word of mouth reco on any product when I ask someone in my offline (or online network). But this was different because I didn’t intend to start a conversation. I wasn’t seeking an opinion. In this case, the advertiser (Apple) planted the seed and what ensued was an awakening of mac advocates who were people in my closed personal/professional network; these are people I trust far more than any expert on CNET and more than the aggregated opinions of hundreds of reviewers on Amazon. I could also have received this video by email, but it wouldn’t have spurred the same interaction that a small Facebook Thread captured (and preserved) for all of my network to see. Not to mention the analytics that Facebook or Apple could get from this episode. Here are some guesses at what an advertiser might be allowed to see in the analytics, in order of increasing value. This entry was posted in Analytics, Marketing, Social Media, Technology, Web, Word of Mouth on December 3, 2007 by Javaun. In the near future, I’ll also be working with both the public sector and social media sections of the Web Analytics Association. This entry was posted in Analytics, Marketing, Technology, Web on October 10, 2007 by Javaun. When advertisers place an ad — a tv, print, radio, or online spot — they try to place it in a program or publication where their core customer group is likely to see it. If you’re watching the Masters, you’ll see a lot of commercials for golf clubs, balls, and any product/service that Tiger happens to endorse. While watching the season premier of “the Biggest Loser” the other night, I saw a lot of targeted ads for weight loss programs and low-calorie foods. I also saw this one for the Dominos Oreo Cookie Pizza. Mmmm… gross. I actually loved the dry humor of this ad. But even if I’d had any inclination to eat a box of Oreos drizzled with icing (not a chance of that), the visuals turned my stomach. I suspect most viewers will have the same reaction. Nowadays, a lot of ads garner attention, but they don’t always help sell the product. As in this case, good creative might even detract from the product. Given all the recent attention paid to obesity and diabetes, I also thought the placement was in very poor taste. The spot actually played right around the time on the show when the trainers presented tables of high fat, high sugar processed snacks and called them “poison.” Nice timing Dominos. Javaun’s Disclaimer: I watch TV maybe twice a month, and I just happened to get stuck on the Biggest Loser. What can I say, I’m a sucker for the overcoming adversity stuff. This entry was posted in Marketing on September 13, 2007 by Javaun. Time Magazine is reporting a new study by Stanford researchers that states that kids age 3-5 statistically prefer a hamburger when it appears in a McDonald’s wrapper versus the exact same hamburger when it appears in plain packaging. Time’s argument goes that more regulation is required to protect children from the influence of corporate advertising. On average, 48% of the kids said they preferred the taste of the McDonald’s labeled hamburger, compared with 37% who preferred the unmarked burger; 59% liked the McDonald’s branded chicken nuggets compared with 18% for the unbranded nuggets, and 77% said the French fries in the bag stamped with the McDonald’s arches and a smile tasted better than the fries from a plain white bag. I do not doubt any of the Stanford study’s findings, and I do agree that children deserve extra protection from advertising’s influence. However, it’s not just the kids who are being influenced. I’m willing to bet that if you duplicated this study against any demographic having a positive or neutral impression of McDonald’s, McDonald’s will always beat the the plain packaging. Cheskin was convinced that when people give and assessment of something they might buy in a supermarket or a department store, without realizing it, they transfer sensations or impressions that they have about the packaging of the product to the product itself… The product is the package and the product combined. Advertising is about spinning a story, selling a dream, or appealing to our natural urges. For kids and parents alike, these are areas of great susceptibility. This entry was posted in Health, Marketing on August 7, 2007 by Javaun. Honor System Yard Sale: Can You Trust Your Neighbors? How honest are your neighbors? Jen and I were forced into relying on their integrity, and we were pleasantly surprised. 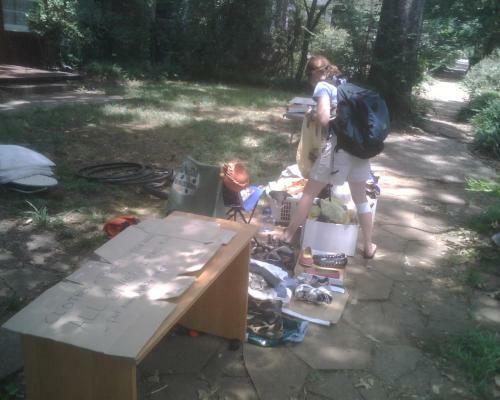 On July 4, we’d advertised a yard sale on Craigslist to get ready for our move to D.C. I was stationed conspicuously in a lawn chair, still in a hard cast and quite immobile. I was the best person for the job both because I couldn’t actually do anything besides collect money and also because I elicited a lot of sympathy purchases. Clothes and Books 50 cents Each. All other items $1. Leave money in mailbox. This entry was posted in How-to, Marketing, Planning Ahead, Tolerance on July 24, 2007 by Javaun. Marketers are working harder than every to capture our attention. A few years ago, a campaign promoting the remake of the King Kong movie put an enormous billboard cutout of King Kong climbing the side of a building in New York. If you sent a text message to a certain number, King Kong’s eyes would blink. Though the technology was rudimentary, this campaign created a lot of guerilla (not “gorilla”) buzz and thousands of passers-by stopped to briefly interact with the billboard. When I got off Marta at the Candler Park station today, I saw a billboard for a new R&B compilation called “Platinum Tracks,” which is available exclusively at Target Stores. 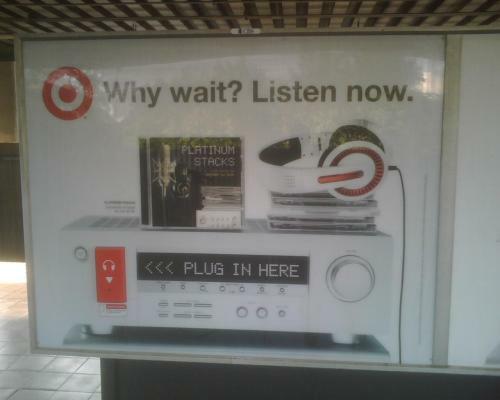 The billboard features an earphone jack, and I actually plugged in my headphones to hear a preview of the album. While this billboard will no doubt create a lot of buzz, it goes a step further and actually demo’s the product. And the placement is perfect. Marta riders have a lot of time between trains, and iPods and portable CD players are ubiquitous, so there’s no shortage of people with headphones. The Edgewood Target store is only a 10 minute walk from the Candler Park station. Great example of a billboard that captures our attention, and once it does, it actually has something valuable to share. This entry was posted in Marketing, Technology on July 8, 2007 by Javaun. Everything I’ve learned about terror attacks, I’ve learned from watching the Die Hard franchise. I know that when terrorists perpetrate elaborately orchestrated attacks on the U.S., they can expect a few things. First, there will be some bureaucrat in charge of the local PD or federal law enforcement agency who will initially respond arrogantly in the face of overwhelming cicumstantial evidence and deny to take any actions which might easily and immediately halt the terror attack. Thank God for that, because if these guys did have any common sense early on, they’d extinguish the terror plot and we’d be left without a Bruce Willis movie. Clearly though, we can’t count on any of the people who are supposed to protect us to be the first line of defense. The terrorists also know this, and it allows their schemes to unfold in highly dramatic waves of attack. First, send an unmistakable warning, which will be mistaken. Next, knock out the authorities’ infrastructure. At this point, the good guys will scramble to actions which play into the hands of the bad guys. Terrorists also always have an inside man or former employee of whatever agency is investigating them. Finally, as terrorists’ actions become increasingly ruthless and they show complete disregard for human life, we ultimately find out that all terrorists are motivated by money, not ideology or power. The one comfort that keeps us all from heading to doomsday bunkers in Montana is that terrorists never plan on a tough guy falling into the wrong place at the wrong time. And so we enter the fourth (or is it fifth) movie in the Die Hard series. Formula aside, I think I enjoyed this Die Hard almost as much as the original. It doesn’t have the raw edge, shock value, or desperation that the first one had, but this might have been the most entertaining. The script is faithful to John McClain’s character without spewing too many catchphrases (although you’ll find one or two familiar ones), and it shows a pleasant evolution. All in all I can say that I would go see a lot more sequels if all of them were this good. This entry was posted in Marketing, Movies, Technology on July 1, 2007 by Javaun.